Almost everything Americans eat contains corn: high fructose corn syrup, corn-fed meat, and corn-based processed foods are the staples of the modern diet. Ready for an adventure and alarmed by signs of their generation’s bulging waistlines, college friends Ian Cheney and Curt Ellis know where to go to investigate. Eighty years ago, Ian and Curt’s great-grandfathers lived just a few miles apart, in the same rural county in northern Iowa. Now their great-grandsons are returning with a mission: they will plant an acre of corn, follow their harvest into the world, and attempt to understand what they-and all of us-are really made of. Ian and Curt arrive in the Midwest enthusiastic about their new endeavor. Iowa’s newest farmers lease an acre of land from a skeptical landlord and fill out a pile of paperwork to sign up for subsidies. The government will pay them $28 to grow their acre of corn-the first of many steps that reinforce the idea that more corn is what America needs. Ian and Curt start the spring by injecting ammonia fertilizer. The chemical promises to increase yields fourfold, fueling the mission of abundance laid out for them. Then it’s planting time, and with a rented tractor, Ian and Curt set 31,000 seeds in the ground in 18 minutes. Their seed has been genetically modified for high yields and herbicide tolerance, and when the seedlings sprout, Ian and Curt apply a powerful spray to ensure that only their corn will thrive on their acre. But where will all that corn go? 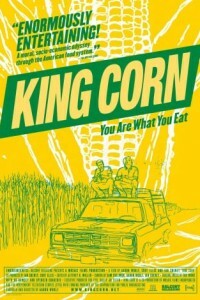 Ian and Curt leave Iowa to find out, first considering their crop’s future as feed. In Colorado, rancher Sue Jarrett says her cattle should be eating grass. But with a surplus of corn, it costs less to raise cattle in confinement than to let them roam free: “The mass production of corn drives the mass production of protein in confinement.” Animal nutritionists confirm that corn makes cows sick and beef fatty, but it also lets consumers eat a $1 hamburger. Feedlot owner Bob Bledsoe defends America’s cheap food, but as Ian and Curt see in Colorado, the world behind it can be stomach turning. At one feedlot, 100,000 cows stand shoulder-to-shoulder, doing their part to transform Iowa corn into millions of pounds of fat-streaked beef. Following the trail of high fructose corn syrup, Ian and Curt hop attempt to make a home-cooked batch of the sweetener in their kitchen. But their investigation of America’s most ubiquitous ingredient turns serious when they follow soda to its consumption in Brooklyn. Here, Type II diabetes is ravaging the community, and America’s addiction to corny sweets is to blame. The breadth of the problem is now clear: the American food system is built on the abundance of corn, an abundance perpetuated by a subsidy system that pays farmers to maximize production. In a nursing home in the Indiana suburbs, Ian and Curt come face-to-face with Earl Butz, the Nixon-era Agriculture Secretary who invented subsidies. The elderly Butz champions the modern food system as an “Age of plenty” Ian and Curt’s great-grandfathers only dreamed of. November pulls Ian and Curt back to Iowa. Their 10,000-pound harvest seems as grotesque as it is abundant. They haul their corn to the elevator and look on as it makes its way into a food system they have grown disgusted by. At a somber farm auction, Ian and Curt decide to tell their landlord they want to buy the acre. The next spring their cornfield has been pulled from production and planted in a prairie, a wild square surrounded by a sea of head-high corn.